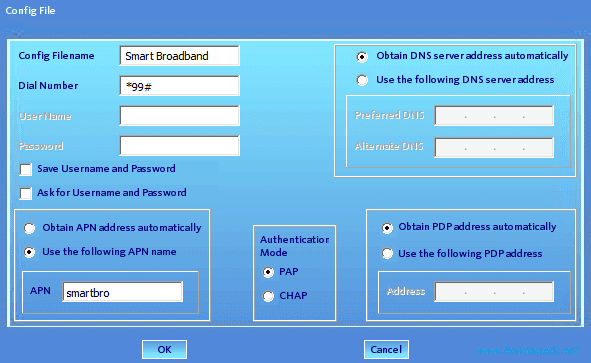 Just like other networks if you want to connect to the internet using Smart Bro you have to configure the correct APN settings. Though all USB modem that comes from the internet provider like Smart (SmartBro), Globe (Tattoo), Sun Cellular (Sun Broadband Wireless) and PLDT (WeRoam) are pre configured with its proper internet settings. In some case this manual configuration is useful like for example you want to create new profile, you have unlocked a USB modem then you want to use Smart Bro sim card to connect to the internet and other cases like you want to delete or create new APN and profile settings. You may also read this post on how to Configure Sun Broadband Wireless and DNS Configuration Setup. That’s it before using the settings make sure that your 3G MMS GPRS settings is activated. To activate just type 3G ON and GPRS ON send to 333, MMS ON send to 3401. See How to activate Smart GPRS, MMS, 3G and APN settings. Settings above will work on any network type even LTE, as long as you are using the right LTE APN on your 4G/LTE capable handset or device. does this still work at this time? It still works thanks man! what about it's smart bro lte? will it use the same setting? Hi Guys, you might help me with my problem. I've accidentally disabled my smart bro pocket wifi and no matter how hard I try, I no longer search for the wifi, even with any device. you can use micro USB cable, plug it on you're laptop or PC. access it via 192.168.1.1 etc... go to wireless settings and enable it again.